When a random person approaches you on the street or at a bar, you are able to decide if you want to talk to them and maybe give them your number, right? Well, not according to a couple of Russian app developers who founded FindFace, an app that can provide you with a passerby’s identity within seconds. The app works by comparing uploaded photos to profile pictures on Vkontakte, a popular social network in Russia with over 200 million user accounts. After the photo is uploaded, the app searches through a billion photos in seconds and provides the user with the identity of the person in the photo as well as ten similar looking people. This app currently boasts a 70% reliability rate and the founders, Artem Kukharenko and Alexander Kabakov have marketed the app as a way for men to meet women. 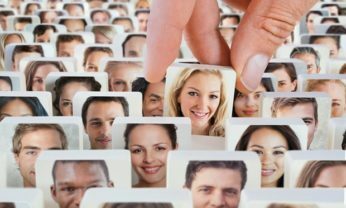 One of the apps creators, Kabakov stated, “If you see someone you like, you can photograph them, find their identity, and then send them a friend request.” Within the first two months of the app’s launch, FindFace gathered upwards of 500,000 users and have processed over three million searches. So how exactly does this technology work? In the same way that a person’s fingerprint may be collected for future reference, identifying a person’s face requires building a faceprint to compare it to. Since our faceprints are left everywhere that we go, our movements can be tracked and stored on a larger scale than ever before. Such facial recognition is effectuated without your permission and you do not have the ability to opt out. While Canada and many other countries in Europe have placed restrictions on how facial recognition technology may be used, the United States has left the field largely unregulated. Currently, only Texas and Illinois have implemented state level laws to protect biometric information. One such law is the Biometric Information Privacy Act, which regulates how a person’s biometric identifiers, including “a retina or iris scan, fingerprint, voiceprint, or scan of hand or face geometry” may be collected, stored, and used. Under the Act, a person must provide written permission before a private entity may obtain any biometric identifiers. The Illinois law has generated a number of lawsuits in which it is alleged that companies have failed to obtain consent before images of people’s faces are scanned and stored. The same technology that allows users to automatically tag friends in photos and that lets us filter ourselves into dogs has landed tech companies in hot water. Facebook, Google, and Snapchat are all facing lawsuits for allegedly violating the Illinois law by producing biometric face prints without first notifying the citizens of Illinois. According to plaintiffs in the current lawsuits, the companies’ actions amount to collecting biometric information. Collecting such information requires more notice and consent that what the companies are currently providing. Recently, Senator Terry Link proposed a revision to the Act which would limit the bill to “data resulting from an in person process whereby a part of the body is traversed by a detector or an electronic beam”. This would rule out scans from preexisting photography and, if the revisions become law, the lawsuits would come to an end. However, when fingerprints and iris prints can be obtained from simply a high-resolution photograph, the proposed separation between photographs and biometric scans does not fit with modern technology. While we cannot stop the advancement of facial recognition technology, we do need more regulation in the area to ensure that our privacy is being properly protected. See Shaun Walker, Face recognition app taking Russia by storm may bring end to public anonymity, Guardian (May 17, 2016, 4:39 PM), https://www.theguardian.com/technology/2016/may/17/findface-face-recognition-app-end-public-anonymity-vkontakte. See Jeff John Roberts, Facebook and Google Really Want to Kill This Face-Scanning Law, Fortune (Jun. 30, 2016, 10:17 AM), http://fortune.com/2016/06/30/facebook-google-facial-recognition-lawsuits/. See Walker, supra note 1. See Tarun Wadhwa, Facial Recognition Will Soon End Your Anonymity in Public, Huffington Post (Jun. 6, 2016, 1:26 PM), http://www.huffingtonpost.com/tarun-wadhwa/facial-recognition-will-s_b_10321972.html?. See Russell Brandom, Apple’s new facial recognition feature could spur legal issues, Verge (Jun. 16, 2016, 8:11 AM), http://www.theverge.com/2016/6/16/11934456/apple-google-facial-recognition-photos-privacy-faceprint. See Wadhwa, supra note 6. See Roberts, supra note 4. See Stephanie Grimoldby, Illinois Facial Recognition Law Leads To Wave Of Class Actions Against Facebook, Others, Forbes (Jul. 5, 2016, 6:00 AM), http://www.forbes.com/sites/legalnewsline/2016/07/05/il-facial-recognition-law-leads-to-wave-of-class-actions-against-facebook-others/#75375ced4e56. See Russell Brandom, Someone’s trying to gut America’s strongest biometric privacy law, Verge (May 27, 2016, 8:27 AM), http://www.theverge.com/2016/5/27/11794512/facial-recognition-law-illinois-facebook-google-snapchat. See Brandom, supra note 7. See Brandom, supra note 15.